Muscle cramps are the result of low sodium levels in your body, and several factors can influence the development. The type of fluids you consume prior to and during exercise is important, and heat can also affect your body's internal health. Muscle cramps are minor injuries that often subside after a few minutes, but when they occur it is dangerous to use the muscle, as damage to the tissues may result. Severe cramping can also damage the muscles on its own. If you develop cramps during a football game, particularly one played in hot weather, there is an easy course of action to treat the cramp and prevent a recurrence. Take yourself out of the game and sit down on the sideline. Depending on the location of the cramp -- many develop in the legs -- you may need assistance to get off the field. Sit down to rest the muscle while the cramp works through itself. Gently massage the muscle and perform light stretches to help it return to a relaxed state. Do not stretch it to the point of pain, but gradually help limber up the muscle. Drink small amounts of a drink containing sodium. Although many associate cramping with dehydration -- and this could be a contributing factor -- you also need to replace the sodium lost from the body. Sports drinks like Gatorade and Powerade can provide your body with this sodium, helping boost sodium levels and preventing future cramps from occurring. 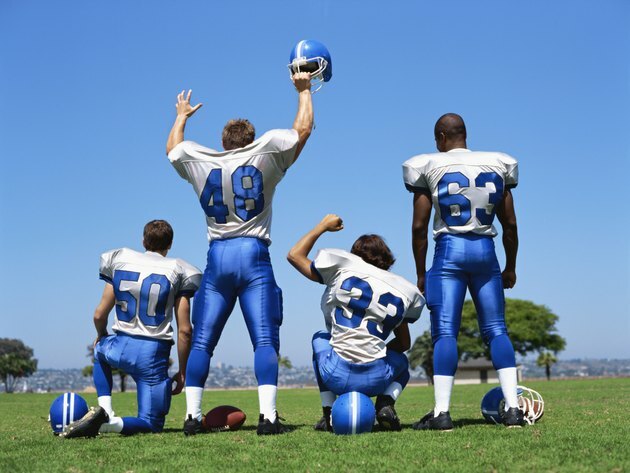 Return to the field once your muscle has returned to normal and you have consumed at least 8 to 12 oz. of a sports drink. Although bananas were long regarded as a cure for muscle cramps, this was because it was believed that cramping occurred due to a potassium deficit. Now that sodium has been identified as a culprit, eating bananas are not attributed with the same benefits as once perceived. Do not continue playing with a muscle if it develops pain after the cramp. This could indicate damage to the muscle.